New bearing on the left, old bearing on the right. Over the past year or so I had stopped using my Craftsman 10" bandsaw. I never thought about why, but I cringed a bit whenever I thought about using it. Turns out that the thing had gotten pogressively noisier. But like boiling a frog, I tolerated it for way too long. Here's how I fixed it. I'm still very happy with this inexpensive little saw. And if you prefer to not have the black and gray Craftsman livery, it's actually a rebadged Rikon. So you can get it in green and white instead if you like. In troubleshooting the noise from the saw, I first loosened the six blade guide bearings and moved them away from the blade. I then plugged the saw back in and fired it up. Super quiet, just like it used to be. Inspecting the blade showed scrapes on the sides from a bearing that isn't turning as it should. Bingo! Looking on the Craftsman website for replacement bearings, I found they will sell them to me for $6 each. That's $36. Not too bad, but I had to wonder if there were any others out there. The Craftsman ones didn't have an ABEC rating (but I would assume that it's adequate), or even state if they were rubber sealed or shielded. The originals have markings so I used those as a basis for my search. The originals are 6262 bearings, 19mm across, 6mm thick, and with a 6mm opening. I found a likely candidate, and ordered ABEC-3 and rubber sealed. They arrived last week, so today I did the install. First, I pulled off an original bearing and did a comparison. 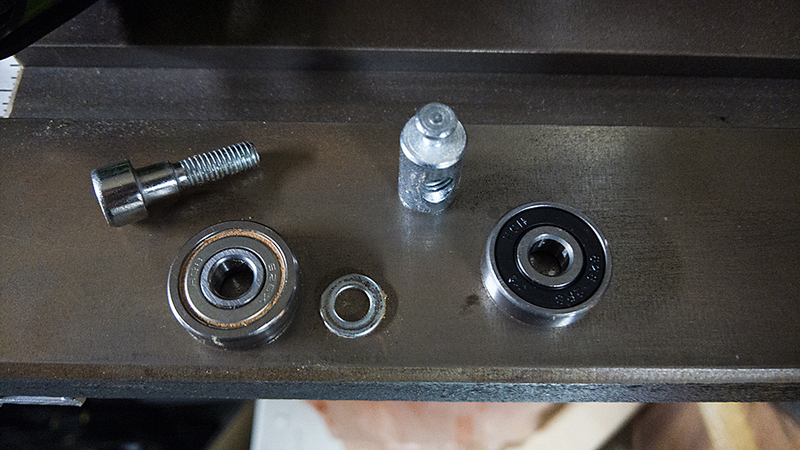 The new and old bearings are dimensionally identical. I pulled one assembly apart so you can see what's involved. In all the photos, the black ones are the new bearings. The tan you see on the old bearings is caked sawdust or resin. In the above photo, the silver thing standing up is the carrier. 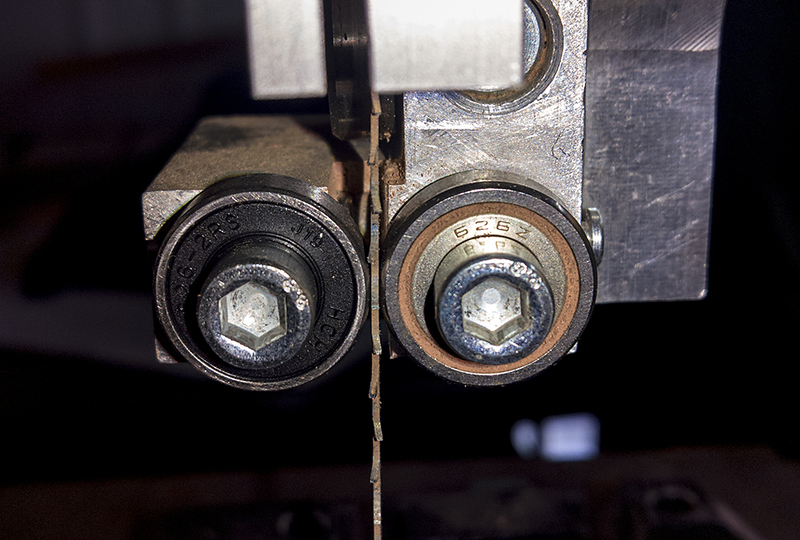 It slides into the saw and the shaft is threaded into the hole on the side. The washer goes between the saw and the bearing. Do NOT lose that washer, or replace it if you do. The bearing race will scrape against the saw if you don't have that washer holding it away. Once I got all the old bearings off, I found that two wouldn't spin at all. The rest were all rough. Like there was gravel inside instead of ball bearings. I installed the new ones, readjusted the bearings (double dolla bill ya'll!) and did a test cut. MUCH better! While this saw will never be as quiet as a nice big professional saw, it is back to its original noise levels when new. I mentioned I bought 100 of these. I'm going to run these new bearings in my saw for a time. If they work as well as I expect, I'll offer up 6 bearing kits for sale cheap either through eBay, Etsy, or on Woodnet. I'll decide when I get to that point. You can buy them yourself, of course. Look for a quality manufacturer (mine are HCH) and you want 6262-2RS bearings. Confirm they're 6x19x6mm. ABEC-3 is about right for tolerances for this relatively slow application.